Rental Application - Click Here! Success is a journey and not a destination. It’s about discovering your ultimate purpose and pursuing it with everything you have in everything you do. A licensed Realtor since 1988, Pat has earned her Broker License and the designation of “Senior Real Estate Specialist” (SRES), which is a perfect fit with her career with the Social Security Administration. She also completed the training that earned her the designation “Historic Homes Specialist”. 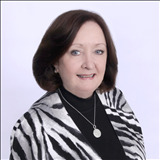 Pat, as a top producing sales agent, has consistently been a member of the Leaders Circle and President's Club and the recipient of the New Jersey Circle of Excellence Award Bronze level 1997-2009, Silver level 2005, 2007. She is a member of the Garden State and the Middlesex Multiple Listing Services. She is a member of the Greater Union County Association of Realtors and Past President of the Education and Programs Committee. Pat received the “Judy Reeves Excellence in Service Award” for her many contributions to her clients, fellow associates and her community. “Pat Plante was acknowledged because of her commitment to community Service and her ongoing mentoring and support to her colleagues.” according to George Kraus, Branch Vice President of the Westfield Office. I have always felt that it is important to give back to the community. I am a current member and Past President of the Fanwood Scotch Plains Rotary Club, the Raritan Valley Line Commuter Coalition. I am also a Trustee and Treasure for the Fanwood Memorial Library and a member of the Fanwood-Scotch Plains YMCA Board of Trustees. I am a life long New Jersey resident who lives in Fanwood . I am eminently familiar with the history of Central New Jersey and the many advantages of living here. Westfield, Fanwood, Scotch Plains, Mountainside, Garwood, Union, Cranford, Watchung, Warren, Bernards Township and all of Union, Middlesex and Somerset Counties.